There’s an article making the rounds on the academic circuit on the importance of writing good sentences: HOW ACADEMICS SURVIVE THE WRITING GRIND: SOME ANECDOTAL ADVICE. In the article, Helen Sword encourages the reader to improve academic writing by recognizing that writing involves editing, and rewriting. I have previously blogged about the importance of valuing ALL writing, including drafting, line-editing, etc. Before I delve into the article, full disclosure: I loved Dr. Sword’s book “Stylish Academic Writing“. And if you read my notes, you’ll know that I did NOT love her latest book, “Air, Light, Time, and Space“. This happens, and it’s happened to me with two excellent authors (Paul Silvia and Helen Sword) who have published great books on academic writing (I loved Silvia’s How to Write a Lot). I don’t claim to be a guru of academic writing. But I do have graduate students, and part of my job is mentoring and training them, and teaching them best practices. One of the practices I encourage (and fellow academics like Dr. Tanya Boza, Dr. Wendy Belcher, and Dr. Robert Boice do so too) is daily writing. 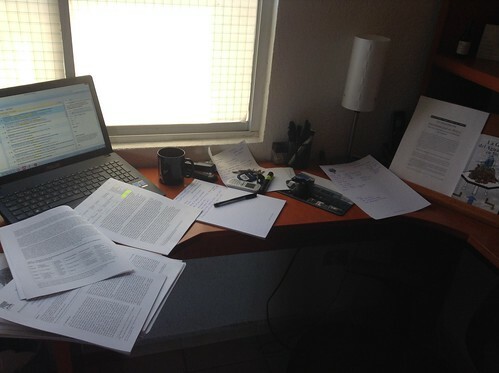 A lot of people tell me “I am not a daily writing kind of academic”. You do you, of course. But my students need to be trained to get a certain number of words out by a specific deadline (this is called THESIS or DISSERTATION), and if the only mechanism to do that is to teach them how to do daily writing, that’s exactly what I am going to do. agree. The desire to write good words in a first draft is a major cause of writers block, even in experienced writers. I, too, read Sword’s blog post. But when I read it I became worried. Not for me. For students, and ECRs, and people who face writers’ block on a regular basis. I write every day. I don’t face writers’ block. I have specific routines (which include using prompts) to fight against those “demons” that convince me that my writing is terrible (I don’t claim to have perfect writing either – I just do it because I know it’s the vehicle I use to learn and share what I’ve learned too). You need to get the words out first, and THEN you can worry about editing. As I read Sword’s post, I became worried, partly because she listed all the characteristics of a writers’ activities. What they think about. Like a laundry list. And the risk with laundry lists and graduate students or early career scholars or novice writers is that they may end up doubting their own writing for too long, thus procrastinating instead of actually getting words out. This is a real risk (and that’s why I preferred Sword’s Stylish Academic Writing much more rather than her latest book) when grad students read this. This was helpful, thank you!! Going over the list in the article was anxiety-inducing for me. As someone who has used thematic coding, and is familiar with qualitative research strategies, I can tell by reading the article that Sword is describing the empirical findings of her research coded in themes: “writers think about CLARITY, they think about VOICE“… etc. This is a particular data analysis reporting strategy, and one that Sword uses in a superbly apt manner in her Stylish Academic Writing book. HOWEVER… this list is not a laundry lists of things that graduate students, early career scholars and blocked writers MUST put their writing through and attempt to check all the boxes. This is not a list of pre-requisites, this is a list of things that successful academic writers (as interviewed by Sword and belonging to her specific sample) do. I think there’s enormous value to Helen Sword’s ALTS book, BUT, as I have mentioned before, these books which are more complex must be read alongside (or taught by) an experienced writer, so that the nuances can be clearly exposed. I definitely will use Sword’s ALTS in my teaching, with the proviso that I believe Sword’s article is trying to push: you must value ALL writing, which includes editing and polishing your words. It takes time. Writing also includes throwing words out and THEN polishing them, creating stylish and well-articulated sentences, etc. But first, GET THOSE WORDS OUT. We refer to this as "barf & buff" in my lab. Not an elegant phrase, but students get it! Get words out, then edit them. Tagged with AcWri, graduate students, mentoring, writing.